(Nanowerk News) In the first fleeting milliseconds after the Big Bang, the Universe consisted of a superdense soup of quarks and gluons that were hundreds of thousands of times hotter than the Sun. Over the next 14 billion years, the Universe stretched and cooled, leaving traces of the original brew trapped inside the protons and neutrons of atoms. Scientists at the RIKEN BNL Research Center are smashing atoms together at high speeds to liberate and observe these remnants of the early Universe and gain a better understanding of our cosmic beginnings. The center was established in 1997 at the Brookhaven National Laboratory (BNL) in the United States. Theoretical, experimental and computational physicists at the center take advantage of some of the world’s most advanced facilities. Among them are the Relativistic Heavy Ion Collider (RHIC), the first of only two accelerators in the world capable of melting heavy ions, the large PHENIX (Pioneering High Energy Nuclear Interaction eXperiment) detector with its dozens of subdetectors, as well as the QCDOC (Quantum ChromoDynamics On a Chip), a supercomputer situated at RIKEN’s Wako campus that achieves 10 tera floating point operations per second (FLOPS)—soon to be replaced by an even speedier successor. 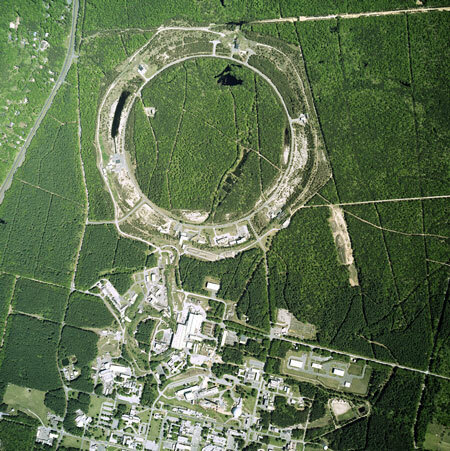 In a typical experiment at the RHIC, beams of heavy gold ions are accelerated around a 4-kilometer ring until they near the speed of light, before being smashed against each other. Reaching temperatures in the trillions of degrees Celsius, the collisions frizzle protons and neutrons to free quarks and gluons for billionths of a second. Their momentary appearance is recorded by the PHENIX detector, one of four detectors at the RHIC. PHENIX precisely measures the momentum, energy and type of particles that emerge early in the collisions. The hundreds of megabytes of data generated by PHENIX every second are then processed by the QCDOC supercomputer, specifically designed to solve problems of a quantum physical nature. Since the center’s establishment, researchers have observed a new form of hot, dense matter with characteristics similar to the quark–gluon plasma of the early Universe. Achieving temperatures of over 4 trillion degrees Celsius, they have identified that the plasma behaves more like a perfectly flowing liquid than a gas. The researchers have also determined—to their surprise—that gluons barely contribute to the spin of protons, adding renewed perplexity to the origins of proton spin.